Auburn vs Alabama Crochet Style! I live in Alabama and one of the greatest rivalries of all time is the SEC football game of Auburn-vs-Alabama! I grew up in a household of Alabama fans and started watching Bo Jackson (the greatest football player EVER!) and became an Auburn fan. I definitely love Auburn even more now that I’ve graduated from the College of Business in May of this year! 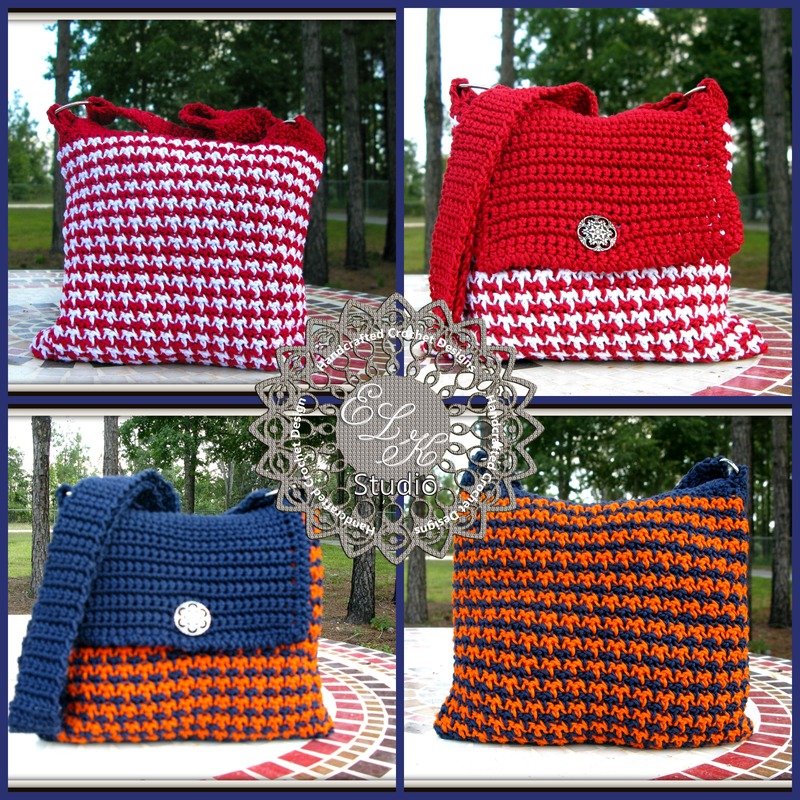 I had two requests for my free Hounds Tooth tote pattern with one being in the Alabama colors (my customer picked the colors and it’s a little shade off, but I don’t think she cares) and the other one dressed up as a WAR EAGLE! I had a lot of fun making both totes and hope my customers will enjoy! The totes are very light weight and would be great to carry around during game day because you can still look cute and have all the girly essentials tucked away safely. It would also be quicker for getting into the gates….right? Have a great day and be blessed! Oh yea….WAR EAGLE baby! Ok. That totally makes me want to learn how to crochet. So cool!! is the pattern posted some place? I didn’t see it. Kathy, these look great. The hound’s tooth is such a classic look and applies to so many different things with great success! P.S…. I love your new logo! Thanks girl! I did that myself and I really like the way it turned out. It’s me…. Wow… its amazing… I need to work on my watermark and my logos too! Yours looks really edgy and stylish! Thank you! I’m going to keep the other one just for my watermark on my photos because it’s perfect for them. I’m sure you will come up with something great! Go to picmonkey and start playing around with it. I think I will work on it this weekend… I do love your watermark… But your website looks excellent with all your new changes!!! !